Looking for Package Deals to Miami? We have those too! 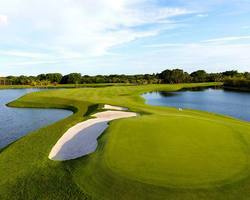 Great Deal at Doral: Blue Monster Stay & Play + FREE REPLAYS for $359 per day! 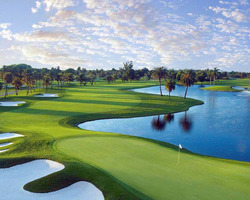 Enjoy the iconic 5-Star Trump National Doral Golf Resort, luxury accommodations and world-class golf for $359 per day! * Mandatory Forecaddie on Blue Monster Course - $25 per golfer payable at Pro Shop day of play. Can add additional rounds at Blue Monster for a surcharge. Ask your Golf Zoo Representative for more information. Prices are based on two golfers sharing a standard garden-view room (king or two double beds). Two night package also available, extra nights and golf can be added. Contact a Miami Vacation Specialist for first-hand knowledge of the area & package details or to get a customized trip itinerary! Perfect Getaway at Don Shula Hotel & Golf Club for $259 per day! Perfect Getaway in Beautiful Miami Lakes at Shula's Hotel and Golf Club! Stay in the quiet, village-like setting of Miami Lakes in deluxe accommodations, plus enjoy the highly-rated Don Shula Golf Club course. Hotel rooms overlook the large pool and whirlpool spa situated in a tropical garden setting. After a day on the golf course, relax at the Spa at Shula's followed by dinner in the award-winning and original Shula's Steakhouse. The Hotel and Club just minutes from Miami International Airport and 30 minutes from Miami's Famous South Beach. This Hot Deal package is available for travel January 1 - April 2, 2019. Prices are based on two golfers sharing a Deluxe Resort Room (king or two doubles). Extra nights and golf rounds available. $259 per person per day, available seven days a week! The breeze of the warm ocean dances on the soft airstream as the golfer held his grip and makes a swing from the tee. As he walks on the greens, the mighty sun explodes his valor over the land to give power to a valiant golfer. As he takes his next shot to the hole, the Freedom Tower ticks its time to the victor. The greens summon its appearance to hold the golf ball to the pattern of which the nature merges with the champ. The natural beauty of the land and its rich cultural history welcomes sportsmen and tourists to discover holiday adventures only found in the Magic City. This course may be booked as part of a Trump National Doral "Stay & Play" package. If you are interested in a "Stay & Play" package please see the listing for "Trump National Doral Resort & Spa - Stay & Play" on the lodging page for details. Already renowned the world over and rich with history, the famous Blue Monster at Trump National Doral is tougher, significantly longer, and more dramatic than ever before. Restored to its past grandeur in mid-2014 thanks to the vision of Doral's owner Donald J. Trump who acquired the hottest golf course architect, Gil Hanse, to meticulously re-sculpt every hole. The 7,590 yard course features a series of strategically placed deep bunkers, long flowing fairways, interesting undulating greens, deep Bermuda rough and a challenging assortment of water hazards - all of which combine for a course that requires both length and finesse to score well. The famous 18th hole is traditionally ranked as one of the most difficult on the PGA Tour. It is no surprise that virtually every great name in golf has had a moment of personal triumph on this world-class course (Jack Nicklaus won twice, Greg Norman three times and Tiger Woods four).Nor is it any surprise that it has once again secured its status as the current and future home to the World Golf Championships- Cadillac Championship. A forecaddie required for the Blue Monster. This course may be booked as part of a Trump National Doral Resort "Stay & Play" package. If you are interested in a "Stay & Play" package please see the listing for "Trump National Doral Resort & Spa - Stay & Play" on the lodging page for details. 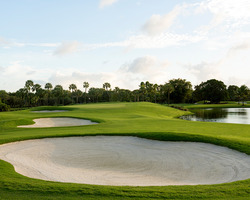 The Golden Palm, appropriately named after the predominate tree found throughout the golf course offers yet another unique and challenging golf experience at Trump National Doral. It was resurrected by Gil Hanse's team with design elements similar to the famous Blue Monster. The course offers a variety of wide open vistas and tight tree lined fairways with heavily contoured greens that will require a smooth putting stroke and soft touch for success. The Golden Palm is also home to a very unique bunker style with tight-cut, clean-edges from the fairway and heavy rough around the back side of each bunker that presents an element of difficulty that you might find in the Australian countryside. The design, quality and attention to detail creates a difficult golf course for all skill levels and makes the Golden Palm a true Championship course capable of hosting the best players in the world. This course may be booked as part of a Trump National Doral "Stay & Play" package. If you are interested in the "Stay & Play" package please see the listing for "Trump National Doral Resort & Spa - Stay & Play" on the lodging page for details. The spectacular Red Tiger golf course, given its name by the late, great Jackie Gleason, just may have undergone the most dramatic change of any of the course renovations at Trump National Doral. Due to the talents of the Gil Hanse design team, the Red Tiger is an exciting challenge for the average golfer but also a surprising test for the more expert player. Set on just 120 acres, its primary design resembles a New England style course but the different varieties of palm trees throughout gives it its distinctive South Florida personality. While the goal of every tee shot should be to take advantage of the gently contoured fairways, the undulation of the small scaled greens requires accurate shot making. This course may be booked as part of a Trump National Doral Resort "Stay & Play" package. If you are interested in the "Stay & Play" package please see the listing for "Trump National Doral Resort & Spa - Stay & Play" on the lodging page for details. 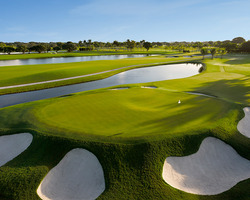 The sensational Silver Fox course at Trump National Doral is one of the most demanding tests of golf in the country. Water comes into play on 16 of 18 holes, and it's striking, marble-white sand bunkers dictate that only well-struck drives and approaches are rewarded. Although there are only 50 bunkers on the entire course, they are strategically placed to require a demanding game off the tee and difficult approaches to the green. Draped in a wall-to-wall carpet of Celebration Bermuda grass, the course is both beautiful to look at and visually intimidating. The narrow landing areas require a demanding game off the tee, yet the greens are true, fast and accessible, so for the golfer who is playing well, a good score is within reason.